What to do with a billion dollars...buy lots of art, of course! At least that’s what oil tycoon J. Paul Getty did. With an 8 billion dollar fortune, Getty was listed by Forbes as the wealthiest American and possibly the world’s richest private citizen in 1957. Despite his insane wealth, he was notoriously frugal; he never bought art items at full price and even initially refused to pay the 2.2 million ransom for his grandson’s kidnapping. Still, by his death in 1976, he had collected over 600 artworks at an estimated value of $17.5 million. In his will he granted roughly $700 million to his museum that only prompted his art collection to expand posthumously. Getty was inspired to collect art after leasing a penthouse from Mrs. Frederick Guest, a relative of Winston Churchill, who collected 18th century French portraits and furniture. He then proceeded to collect art for the next 45 years, likely as a distraction from his many business responsibilities, and ended up collecting so many pieces of art he ran out of room in the museum wing of his Malibu estate. His Malibu dream house underwent renovations to house his collection of classical antiquities--some of which have been as discovered as fake or stolen--in what is now known as the Getty Villa, sister campus to the Getty Center. Construction of the Getty Center began in 1989 and completed in 1997. With over a thousand people working on the site, it became the largest single-phase project in the history of Los Angeles. The Getty Center houses European artwork and international photography, though there are special exhibitions containing art outside the permanent collection. Some notable artists you’ll see at the Getty Center include Peter Paul Rubens, Vincent Van Gogh, Edgar Degas, Paul Cezanne, J.M.W Turner, and the artist that first impressed Getty, Titian. While the Getty Center may not be as Instagrammed as other SoCal museums like LACMA or the Broad, it’s actually the most visited art museum in California and one of the most visited art collections in the world, averaging more than a million guests annually. Visitors take a tram from the parking lot Disneyland-style to the main plaza where you can view art at the five available pavilions, explore the labyrinthine gardens, or just admire the beautiful view of Los Angeles. The best part about the Getty Center is that it’s completely free! Getty intended his museum to be a gift to the people of Los Angeles so he wanted his collections to be completely open to the public, completely free of all charges. Maybe having lots of money doesn’t make you so bad after all. The original Getty Villa is located on the edge of the Malibu on top of a mountain overlooking the Pacific Ocean. Totally prime real estate. Unfortunately, with all the rich movie stars and business executives trying to get a whiff of that fresh ocean air, overcrowding hindered the Getty’s expansion and thus the second Getty was born. Perched on top of another mountain in Brentwood (they didn’t downgrade too much), the Getty Center exists as a shining beacon of art and architecture. Or, it would be a shining beacon if you could see it through all the smog. But on those rare days it rains and the brown cloud clears, this museum has one of the most breathtaking views in SoCal. The Getty Center exhibits artwork from the Middle Ages to the present and attracts 1.3 million visitors a year, making it the fourth most visited museum in the country. The Getty Villa on the other hand, which was closed until 2006, houses art from ancient Greece and Rome. J. Paul Getty was an American industrialist and founder of the Getty Oil Company. (I’m sure we’re all happy to see oil money actually benefiting society. For once.) In 1957, Fortune Magazine named him the richest living American and nine years later the Guinness Book of World Records dubbed him the richest private citizen in the world. And to think, he was able to maintain that title even though he was married and divorced five times, allowing each wife to snag a good part of his fortune. He was an avid art and antique collector and at the time of his death, $661 million of his $2.2 billion estate was left to the museum. As such, the Getty has more money to toss around than most other museums, and the result is stunning architecture, lush gardens and huge expanses of white marble. In typical L.A. fashion, the Getty doesn’t hold back on the entertainment factor, either. You even get to to ride a winding tram to the hill-top entrance from your car. Plus, admission is free! Including parking. This is unheard of in Los Angeles. So if you find yourself in sunny L.A., there really isn’t any reason not to check this place out. Except for getting stuck in traffic on the 101 of course. Located in the Brentwood neighborhood of Los Angeles, the Center is one of two locations of the J. Paul Getty Museum and draws 1.8 million visitors annually. (The other location is the Getty Villa in the Pacific Palisades neighborhood of Los Angeles, California.) The Center branch of the Museum features pre-20th-century European paintings, drawings, illuminated manuscripts, sculpture, and decorative arts; and photographs from the 1830s through present day from all over the world. In addition, the Museum's collection at the Center includes outdoor sculpture displayed on terraces and in gardens and the large Central Garden designed by Robert Irwin. Among the artworks on display is the Vincent Van Gogh painting Irises. 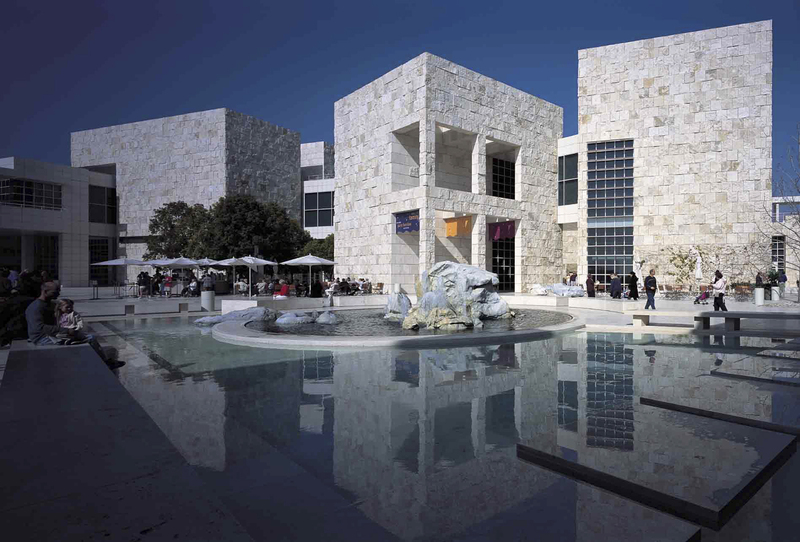 Designed by architect Richard Meier, the campus also houses the Getty Research Institute (GRI), the Getty Conservation Institute, the Getty Foundation, and the J. Paul Getty Trust. The Center's design included special provisions to address concerns regarding earthquakes and fires. Check out the full Wikipedia article about Getty Center.